Kitchens, in today’s modern and stylish times, are being equipped with the best looking, high performing and long lasting accessories. With innovative styles and features that not only perform the routine task but also add style and glamour to your kitchen, you are sure to make your kitchen a favorite hangout in your home. Granite kitchen sinks are one such highly durable and robust kitchen equipment that is increasingly being used for its strength and a very stylish look. Granite kitchen sinks have a rustic look that adds a natural appearance to the adjoining kitchen platforms. At the same time they are quite easy to clean and maintain too. Due to their high durability, granite kitchen sinks can easily hide scratches and blemishes. Granite kitchen sinks are heavier in weight as compared to the other materials like stainless steel. Hence they require a very strong support underneath and must be installed with care. 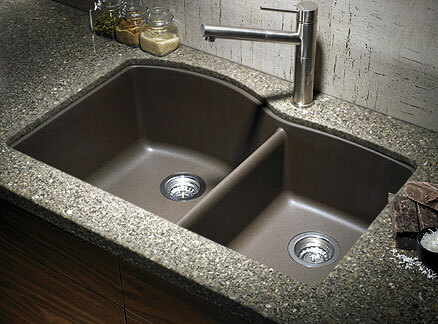 Composite granite kitchen sinks are made of crushed natural granite and acrylic compounds. The material is tougher and more resistant to heat. It is also quite durable, resistant to chipping and scratches that come with heavy duty cleaning and everyday use. The hardness of a composite granite kitchen sink doesn’t spare the expensive glass and chinaware, and hence care should be taken while washing them in such a sink. It is much lighter in weight as compared to the regular solid granite sink. However, installation of composite granite sinks requires care as there are chances of cracking while hammering in the knockout hole. Undermount composite granite kitchen sinks must be supported securely to prevent their collapse through the countertop hole. If you are not comfortable or confident of installing your undermount granite kitchen sink yourself, you can always consider having the contractor install it for you. Black granite kitchen sinks are the most stylish and classiest granite sinks. Though there are other colors available but black is usually chosen for its beauty and ability to hide the scratches or wear and tear. Cleaning and maintenance is therefore a must to keep the shine and beauty of black granite kitchen sinks. While choosing a granite kitchen sink, you may like to consider a few points before making the final purchase. Firstly you may want to consider the dimensions of the countertop hole in order to decide the right size of the granite kitchen sink. Again the size would also depend on the size of your kitchen. In case you have a small kitchen, you would like to save space by keeping sink size small. However, in case you have a large kitchen, you may want to go for a large sink. In case you are replacing the sink, additional cabinetry work may be required. Faucet and sink accessory should be planned in advance for deciding on number of faucet holes for the sink. Again depending on the regularity, load and kind of cleaning work, you may want to go for a double bowl granite kitchen sink instead of just a single bowl granite kitchen sink. Double bowl sinks have an advantage as one bowl can be used for cleaning while the other for regular cooking related work. However, they suit a large kitchen and may not be a great idea for a small kitchen. Whether you need deep bowls is another consideration depending on your workload, height and ease of cleaning. All these features can significantly affect in making your cleaning work pleasant or cumbersome. Hence decide on them well in advance before you make a final purchase. Different colored granite kitchen sinks are available to suit the décor of your kitchen, but black granite kitchen sink is always an option if you want to add a dash of class and style. Granite kitchen sinks need gentle care to last long and maintain its good shine. Abrasive or harsh cleaners should not be used and after every use you must wipe it clean and dry. Once or twice a month cleaning is good enough to keep it clean and shining long. Click here for the best deals on granite kitchen sinks. Among the well-known manufacturers of granite kitchen sinks are Blanco, Swanstone, Pegasus and Elkay. I love the clean, solid look of granite, and it can add so much quality to a kitchen. Great post.